It’s Olympics week and for that occasion, we bring you another storied competition from downtown Boston. Besides duels, the Boston Common also hosted less lethal competitions. 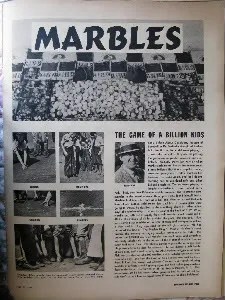 A marbles competition on the Common in 1924, sponsored by the Herald-Traveler newspaper attracted a large crowd. This photograph was taken by Herald-Traveler’s staff photographer, Leslie Jones. The man on the stepladder is the referee. This was the era of serious, national marble championships. The same year, the champion of the New England year would go on to vie for the United States Crown in Atlantic City in front of 2,000 spectators. However, young boys’ sports on the Common weren’t always so well received. The following comes from the Samuel Barber’s book Boston Common, published in 1916. The Common was always a playground for boys — wicket and flinging of the bullit was much enjoyed. Flinging the bullit was finally prohibited as dangerous to pedestrians who chanced to be passing. No games were allowed to be played on the Sabbath, and a fine of five shillings was imposed on the owner of any horse seen on the Common on that day. People were not even to stroll on the Common, during the warm weather, on Sunday. Wicket, at the time, appears to have been a sport related to, but not identical to cricket. ‘Flinging’ or thowing the ‘bullit’ was a sort of shotput competition where a stone, or later on, a ball of metal was thrown along a road or path. The winner covered a fixed distance in the least number of throws. This entry was posted in Boston and tagged Atlantic city, Boston Common, competition, Games, Herald-Traveler, Leslie Jones, Marbles, Wicket. Bookmark the permalink.